Senior Marnie Frost competed very well in her last MHSAA Cross Country State Championship meet on Saturday, November 3rd. The course was quite muddy from rain earlier in the week which made for some interesting racing. She ran a smart race and finished strong. She also had a lot of family and team support that ran all over the course cheering her on. Marnie has qualified for the State meet her freshman, junior, and senior years of high school. She has been awarded Academic All-State again for the 2018 cross country season. 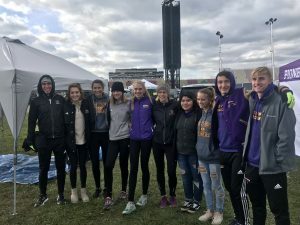 Congratulations to Marnie Frost and the entire cross country team for an outstanding season.